Floraville Phuket Resort, located on a gently sloping hill of Chalong district offers you 20 comfortable bungalows for rent in Phuket. Once at the Floraville Phuket Resort, you will find yourself surrounded by the peaceful environment of lush, tropical, green plant life, coconut palm trees and a seemingly endless variety of exotic flowers. All accommodation features comfortable beds with large bedrooms, personal electronic in-room safe, clean bathrooms and luxury living room. 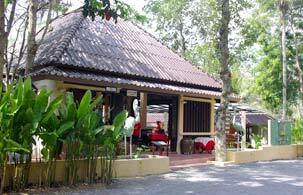 Most of our bungalows have private verandas to give you the feeling of staying right within a forest. Floraville Phuket Resort has been designed for the complete relaxation and leisure enjoyment of every type of guest. Whether you are on a business trip, with family, on your honeymoon or traveling with a group, to rent a bungalow at Floraville Phuket Resort will enhance your unforgettable and pleasing time. Free maid service every day.